Exposure: 16 x 32 sec and 16 x 10 sec with Orion Skyglo and Baader IR Block for Luminance exposures; 16 x 16 sec R,G,B exposures. Processing: All exposures captured in K3CCDTools 2. Alignment and stacking was done with Registax 3 and saved as FITs. LRGB channels were co-registered in IRIS. Luminance and Color channels were scaled and rough color balanced in IRIS. The luminance channel was constructed with the with the 32 sec exposure as the base exposure; the 10 sec exposure was used to reduce star size on the larger stars. LRGB channels were resized to 800x600 prior to LRGB combine. Final LRGB combine was done in Photoshop using Luminance Layering (or LLRGB). Color balancing and final touches were done in Photoshop (Blue halo subtraction and background noise subtraction). SGBNR (PixInsight LE) was used to smooth remaining background on the luminance channel. Final image size is approximately 800x600. This image was a guided exposure. 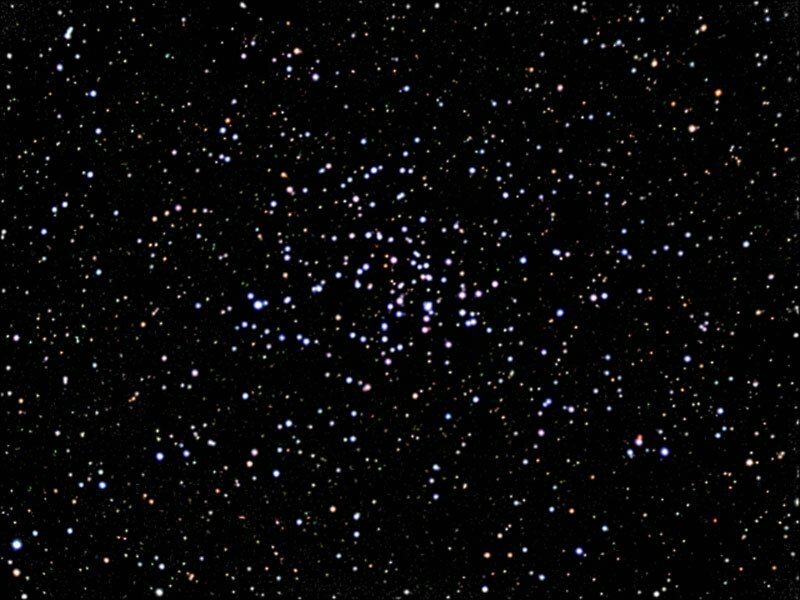 NGC 2360 is the cluster in the image. It is located in the constellation Canis Major - neighbors are Sirius M41, M46, and M47 North is up in this image. This is a second image of this cluster, the original image can be seen in the Archives here. Horizontal FOV is about 30'. Image center is at Equatorial 2000: RA: 07h 17m 43s Dec: -15°38'29"